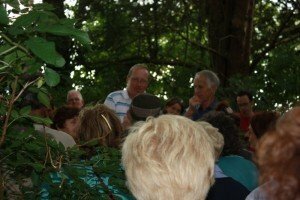 The Heritage Walk through Bracklyn on Sunday 21st August was the most successful event in which the D. H.S. have been involved in to date. 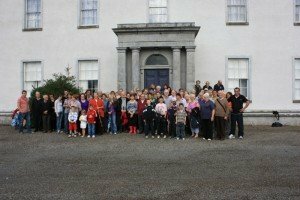 The sun shone brightly as over 130 persons turned up for the walk around Bracklyn Demesne which was previously home to the Fetherstonhaugh family. 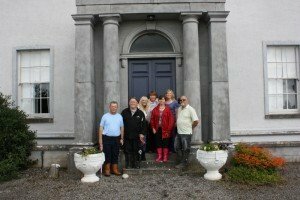 Local historian Michael Murphy led the walk which commenced at the Gate lodge, where Michael informed the group of the architectural importance of the lodge built in 1821 of which only two of similar design exists in Waterford. From the gate lodge to the main house involved a walk of at least half a mile through lush green fields ending in front of a detached five storey neoclassical “Country House” with a “Dorie Porch” which was added on in 1855. Bracklyn House was built by a branch of the Fetherstonhaugh family in the late 18th century on land acquired from the Pakenham family of Tullynally Castle. The present house occupies the site of a 15th century tower house. From the house going north over cut fields of barley we made our way to a small copse where hidden from view was the Mausoleum of Howard Fetherstonhaugh. Michael spoke of Fetherstonhaugh the magistrate and wealthy landowner who was consolidating land by raising rents etc, and which caused a lot of hardship to the tenants around 1860 by forcing them from the land, this tactic worked as only 9% of land on the Bracklyn estate was occupied through rental agreements. 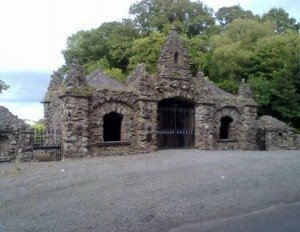 In 1868 Howard Fetherstonhaugh met his death through the hands of assassins working under the name of “Rory of the Hill”. No one was ever charged with his death and has become known as the “Evictor’ Death”. 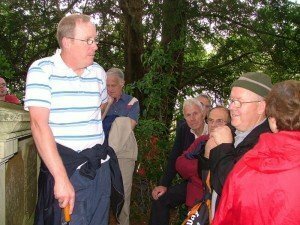 All through the afternoon the group chatted among themselves telling stories of times past and it was agreed a most informative, pleasant afternoon was enjoyed by all present. 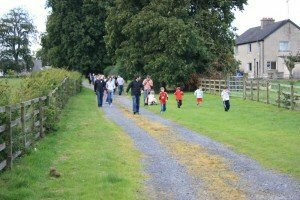 The Delvin Historical Society would like to thank Bernadette Solon – Conservation Architect and Westmeath Co. Council for their support. Special thanks also to Michael and Walter Kenny, Eileen Orme, Mary Clune, who gave great insight of their working life on Bracklyn Demesne and finally to Michael Murphy for his excellent talk on Howard Fetherstonhaugh.